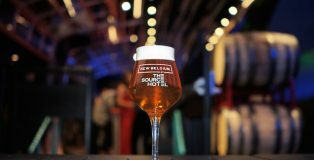 The long-awaited project pairing a budding local mixed-use development empire in Zeppelin Places, with one of craft beer’s most storied pioneers, New Belgium Brewing, has finally opened to the public. 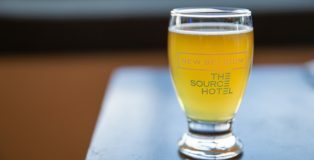 The Source Hotel, the fourth major mixed-use space in Denver’s River North Art District from the Zeppelin team following Taxi, The Source and Zeppelin Station, has been a long time coming. In fact, New Belgium Brewing and Kyle Zeppelin’s team had been collaborating on this project since 2014. Normal construction delays and accidents made opening a practice of patience for everyone involved, but the excitement was palpable as Kyle Zepplin (developer), Stephen Dynia (architect) David Stutz (The Source Hotel GM) and Kim Jordan (New Belgium) addressed the crowd at the soft-opening this past Thursday. The golden rays of the Colorado setting sun cast shadows upon laughing faces at this year’s Brews and Bites event. 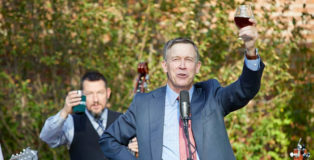 Set to the backdrop of the Governor’s sprawling backyard garden, some of Colorado’s finest breweries and dining establishments were paired together to bring event goers unique and flavorful tasting experiences while mingling with Governor Hickenlooper himself.